Can you ship gold with FedEx or other private courier services? In this post we will cover how and why average silver bullion shipments by FedEx are prohibited. As well we will show you other options you can utilize to ship physical silver bullion throughout the USA (and possibly elsewhere around the world). Most individuals involved in the process of shipping silver bullion sold back to gold bullion dealers do not have access to these insurance policies due to limited volume and size of most gold investor shipments (there are some exceptions we will allude to later on). The good news is that we can offer such services to our customer base. Simply give our bullion team a call ( at 1.800.294.8732 ) to to discuss our current silver shipping rates and procedures. For those selling and or shipping silver bullion in large size, we can also possible provide you with convenient professional silver shipping options as well. 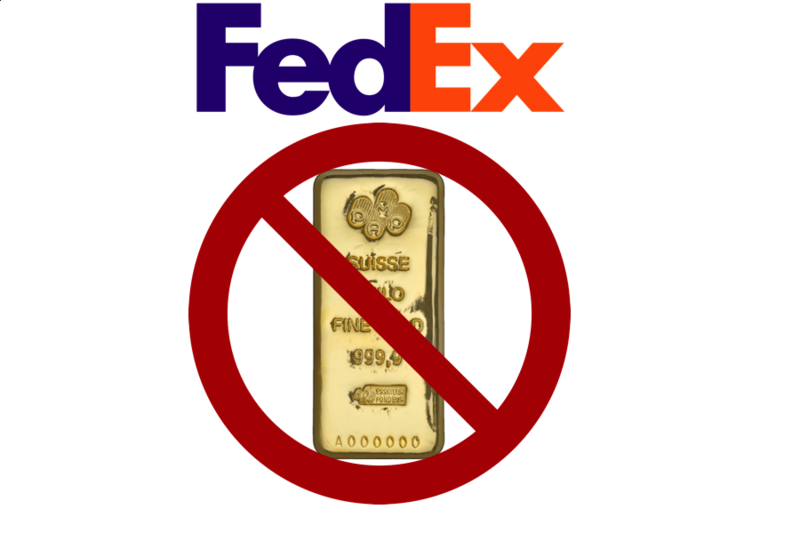 First let us show you what FedEx expressly prohibits from its US origin shipments so you fully understand that trying to ship silver bullion on your own, is risky and not allowed by FedEx. 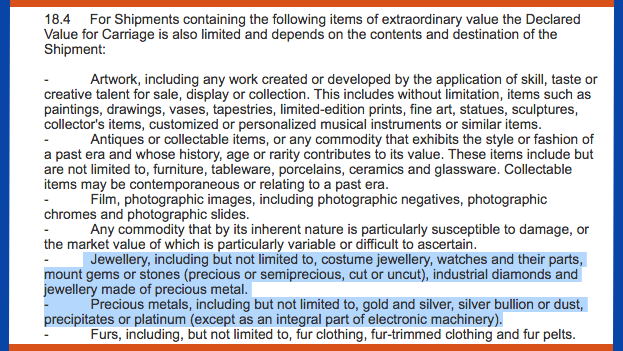 FedEx expressly prohibits standard shipments from containing physical precious metal gold bullion products. Come learn the facts and how you can still ship gold bullion with FedEx or other private courier, parcel and express mail services. - Film, photographic images, including photographic negatives, photographic chromes and photographic slides. - Any commodity that by its inherent nature is particularly susceptible to damage, or the market value of which is particularly variable or difficult to ascertain. - Jewellery, including but not limited to, costume jewellery, watches and their parts, mount gems or stones (precious or semiprecious, cut or uncut), industrial diamonds and jewellery made of precious metal. - Precious metals, including but not limited to, gold and silver, silver bullion or dust, precipitates or platinum (except as an integral part of electronic machinery). - Furs, including, but not limited to, fur clothing, fur-trimmed clothing and fur pelts. The following is a screenshot of the same explicit prohibition for shipping gold with FedEx, again this is from section 18.4 in the FedEx terms and agreements in late winter 2018. If you are looking for fully insured gold shipping options, simply give our bullion team a call ( at 1.800.294.8732 ) to to discuss our current physical gold shipping rates, options, insurance, and procedures. For those selling gold bullion lots in large sizes, we can also possibly provide you with convenient professional gold shipping options as well.